The image of the balaclava-clad axeman on the cover of Samson's 1980 'Head On' album is arguably more iconic than the underrated music it contained. The man in the mask was Thunderstick (or Barry Graham Purkis), the drummer's larger than life stage antics often overshadowing the band he kept time for. 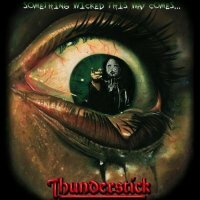 As the insightful Unsung Heroes column in the previous issue of Fireworks* alluded, prior to that the drummer was part of the fledgling Iron Maiden, but in truth, once Thunderstick parted company with Samson a few years later, his profile slowly began to wane. Forming an eponymous band in 1981, an EP and album would follow, but the early momentum was allowed to slip away. A few songs appeared on various compilations during the mid-eighties, but the band folded in 1988 and that seemed to be that. Out of the blue, two new songs appeared on the 1999 compilation 'Best Of British Metal', with both 'Dark Night Black Light' and 'Shining' showing the promise this band always possessed. However, it wasn't until Thunderstick's previous singer and one-time partner, Jodee Valentine, passed away in 2016 that the drummer was driven to make sure the unreleased material the pair had often performed live would eventually see the light of day. To do so, the masked man teamed up with ex-Thunderstick guitarist Dave Kilford, while it fell to the wonderfully expressive voice of Lucie V to bring seven vintage and three new Thunderstick cuts to life. Both 'Dark Night Black Light' and 'Shining' make a reappearance, the former revealing a familiar commercialised Punk Metal attack that characterised the early Thunderstick sound, whereas the latter possesses a more Glam-tastic stomp. However, it's the aggressive 'Go Sleep With The Enemy (I Dare Ya)' that suggests there's still life in this old beast, the killer chorus proving thoroughly irresistible. With 'I Close My Eyes' an acoustic lament, 'Don't Touch I'll Scream' a mid-paced Melodic Rocker and 'Encumbrance' hitting like a slice of seventies shuffle, there's undoubtedly an unusual flow to this album. However, that said, 'Something Wicked This Way Comes' does have an unquestionably vintage charm, even if the production is decidedly lo-fi in places. It might not be a hard-hitting slice of British Heavy Metal brilliance, but this unexpected effort from this long-forgotten outfit is certainly the best to date from Thunderstick outside of Samson.